A monopod is like a tripod, in that it is used as a telescoping stand that can support a camera, a pair of binoculars, or even a rifle. But a tripod takes some time to set up, and requires a level area. 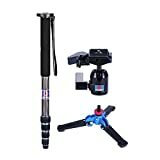 Therefore, you would like to have a monopod as well, because it offers more mobility than a tripod, and more stability than just holding the camera in your hand. 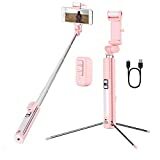 It can be used as a selfie stick, or you can use it when you want to capture a still shot of a wildlife scene or sporting event. It also occupies less space than a tripod, so monopods are good in tight or crowded areas. You’ll find monopods from steel, aluminum, and carbon fiber; you’ll also see different designs: monopods from 4, 5, or 6 segments. Steel: This is of course a strong and durable metal, but it has the disadvantage of being heavy and not so portable. Aluminum: This is a significantly lighter metal, offering greater portability. It is much cheaper than the carbon fiber alternative. The Smatree SmaPole S2 is made from aluminum alloy. Carbon Fiber: This was developed in the 1960s, and cuts down the weight of the monopod significantly. You can find carbon fiber monopods that weigh as little as 400 grams. We can also distinguish between the number of sections in the telescopic tube: it can consist of 3, 4, 5, or even 6 segments. 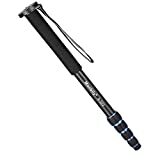 Serves as a hiking pole: Some monopods serve as hiking poles as well. 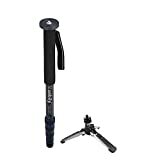 The Manfrotto MM294C4 Series 294 can telescope out and serve you as a walking stick as well as a support for your camera. 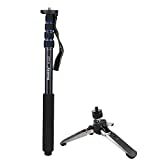 Swivel top: Some monopods, such as the Manfrotto models, have a swivel top, which allows the camera to have greater mobility. The camera can be tilted at a number of angles. Compass: There are monopods that have a compass built into the wrist strap. It can come in handy in aligning the camera. Weight allowance: We mentioned that the monopods themselves can be very light. But they have to be able to support a lot of weight-- sometimes camera gear can be as much as 10 kg, so the monopod must be strong as well. The Sirui P-326 has a capacity of 22 kg! (It’s unlikely you’ll have to support anything that heavy. 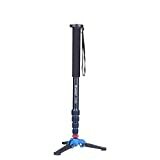 Can’t be used unsupported: Since it consists of only one leg, a monopod must be supported. There are several ways of positioning yourself so that the monopod is stable. You can plant the monopod in the ground, and stand behind it and support it. You can also stand alongside it, or wrap your leg around it to keep it in place. You can also make a “chest-pod” or “belt-pod”, by shortening the tube and supporting the camera against your chest or hip. Use as a support for binoculars: A monopod is not only for cameras. If you have binoculars that magnify over 10X, they’ll be too heavy to hold just with your hands. But a monopod can give you that extra support and stability that you need. Spiral twist lock: Here you unscrew a tightening element ¼ turn. This releases the telescoping tube, so that you can slide it out. Then you screw the element back to lock the telescoping tube into position. Snap lock: This has a spring-activated button that pops into place in holes in the telescopic tube. You set it at the desired length, and the spring locks the button in place. This seems more durable, since the screws of the screw-design might become over-tightened such that it ruins the threads on the screw. 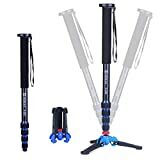 Length: Look at the minimal and maximal lengths of the monopod--that will give you an idea of what you can do and what limitations it has. For example, the Smatree SmaPole S2 has a minimum length of 15.8 inches and a maximum of 40.5 inches. Manfrotto--was founded by Lino Manfrotto in 1972, and is based in Bassano del Grappa, Italy. They are designers and manufacturers of camera and lighting equipment for professional photography, film, theater, live entertainment, and video. They produce camera tripods, tripod heads and legs, camera filters, lighting stands, and more. Sirui--Sirui Optical Company was founded in 2001, and is located in Zhongshan, China.They make professional photographic and video support equipment, including mobile phone lenses, tripods and tripod heads, monopods, camera bags, and camera safety equipment. Smatree—is part of the ShenZhen Mobai Technology company. 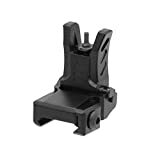 They make sport camera accessories. They make power cases and GoPro accessories for taking photographs in all sorts of situations. 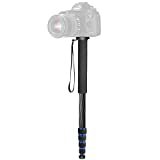 Altura Photo--makes a variety of photo accessories, including cleaning supplies, tripods, lenses, camera bags, flashes, filters, rain covers and lens hoods, and much more.